Preview & stats; Who did you rate man of the match? 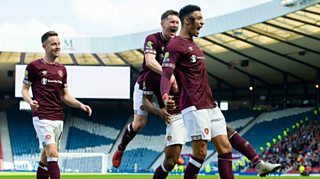 So, Hearts book their place in the Scottish Cup final, courtesy of a superb second-half display against Inverness CT.
Who will join the Jambos? We're back tomorrow for the second semi-final as holders Celtic face Aberdeen. Our player rater is now closed, you voted Hearts midfielder Jake Mulraney as man of the match at Hampden. Inverness CT boss John Robertson: "I'm disappointed for the players and for the fans. I thought we were fine in the first half, we competed well and there wasn't much in the game. "You would expect Hearts to have more of the ball, which they did. There wasn't really many clear-cut opportunities for either side. "We said to the players 'well done' and we've lost a goal [after the restart] within five minutes but we knuckled down and were terrific for the next 15 minutes. "We knocked the ball about and started to cause them problems by getting behind them. "To beat a Premiership team, you need a bit of luck. The fingertip save from Zlamal is unbelievable, it's one of the saves of the season. "If that goes in, it maybe rocks Hearts a bit. "Once the second goal goes in, there's only going to be one winner. But we kept playing and kept going." 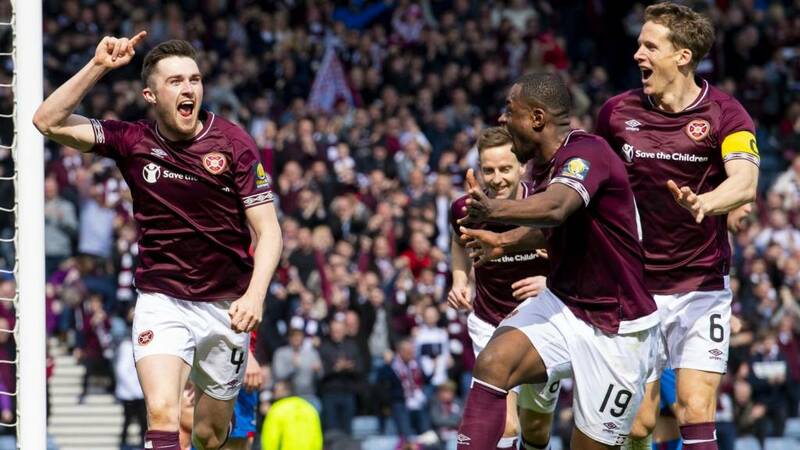 Hearts boss Craig Levein can now look forward to his first Scottish Cup final as a manager. "We've haven't been in the best of form recently, so it was important to play with a calmness and clear heads," he tells BBC Scotland. "First-half, we didn't really get going. We had opportunities but not as many as I'd have liked. I didn't think we'd lose a goal but the occasion maybe got to the players, it's the first time a lot of them have played here. "Second half, we controlled the match. Bobby (Zlamal) has made one save. I wasn't even looking. I know that Chalmers is so accurate. All credit to Bobby. We needed him on that occasion and he was there. 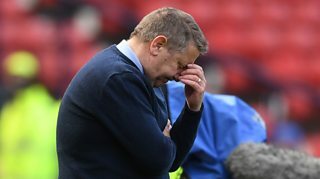 Craig Levein praised Hearts' "calmness and clear heads"Image caption: Craig Levein praised Hearts' "calmness and clear heads"
"Once we got in front, I thought we were comfortable. We've sent our supporters away happy, which is the main thing and we will be back here in May. "I said to Jake Mulraney that I was so proud of him. He's the kind of player that needs confidence. We've seen glimpses of what he can do and it's really just about him putting that together consistently. He was our main outlet and caused Inverness all sorts of problems. "Uche Ikpeazu is a young guy and he's still learning. He has brilliant moments and then sometimes he's struggling to control the ball. The effort he puts in is astounding, chasing lost causes. Seeing that pure effort is what appeals to the supporters." A delighted Hearts striker Uche Ikpeazu tells BBC Scotland: "We don't care who we get in the final. We just want to enjoy this moment. Scoring in a semi-final is an amazing feeling. "We've done our job, we're just going to relax and focus on the next game. "Even when I don't play well, the fans believe in me, they keep supporting me. We had 18,000 supporters here today backing the team. It means a lot." Hearts captain Christophe Berra tells BBC Scotland: "In the end, it was quite easy, so we're happy to be through. "It's a dream come true. I came back to the club for that reason, to win things. The final will be a great day." Hearts skipper Christophe Berra says the Scottish Cup final will be "a great day"Image caption: Hearts skipper Christophe Berra says the Scottish Cup final will be "a great day"
Hearts manager Craig Levein is all smiles in the Hampden sunshine, congratulating his layers before saluting the supporters at the national stadium. In sharp contrast, the Inverness CT players cut a dejected bunch. Understandably so. John Robertson had said pre-match that the semi-final was the worst time for a cup run to come to an end. Hearts book their place in the Scottish Cup final - where they will face Celtic or Aberdeen - with a convincing victory over Inverness CT.
One minute added by referee Don Robertson. A long ball is easily dealt with by Hearts, who intend to keep a clean sheet en route to booking their place in the Scottish Cup final. Who has impressed you at Hampden? Which Hearts player did you rate man of the match? Which Hearts player did you rate man of the match as the Scottish Premiership side beat Inverness Caledonian Thistle in the first of the weekend's Scottish Cup semi-finals. Six minutes plus added time remaining at a sun-kissed Hampden. Hearts supporters are roaring on their troops in search of another goal, but this Scottish Cup tie has been decided. Inverness CT, though, are still searching for at least one consolation goal. Those in maroon in Hampden have an extra spring in their step as they go in search of a fourth goal to cap an impressive second half display. Oliver Bozanic is the latest to threaten Mark Ridgers, whose goal has been carpet-bombed since the break. Talk about a contrast. In the first half, Hearts appeared laboured and lacking imagination in the final third. 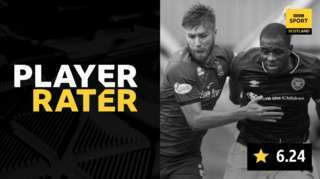 Since the restart, they've been razor sharp and have punished Inverness CT on three occasions.